British Home Secretary Theresa May is expected to publish proposals aimed at allowing the National Crime Agency (NCA) to operate in Northern Ireland, despite major Sinn Fein and SDLP concerns over accountability arrangements. The move comes as political discussions at Stormont aimed at breaking the impasse over the British government proposals to allow the NCA to operate in Northern Ireland appear to have ended without agreement. The agency, which has been dubbed Britain’s new ‘FBI’, is due to be established in October to target crime gangs across local, national and international borders. As many of the policing powers due to be allocated to NCA have already been devolved to Northern Ireland, the Stormont Assembly is obliged to pass a Legislative Consent Motion (LCM) giving the House of Commons the authority to pass legislation before NCA officers can fully operate with police powers in Northern Ireland. However, earlier this month the nationalist parties blocked a consent motion from being approved by the Stormont Executive which would have allowed the NCA to operate here. The nationalist parties refused to support the legislation claiming it would create an unaccountable second police force which would be allowed to operate without proper scrutiny from PSNI Chief Constable Matt Baggott, the Policing Board or Police Ombudsman’s Office. If the motion had been approved this would have meant NCA officers having the same powers as PSNI officers, including the authority to conduct searches and make arrests; undertake surveillance operations; recruit agents and recover assets from criminals. However nationalists and human rights groups have insisted that the NCA should only be allowed to operate in Northern Ireland under the direction and control of the PSNI. 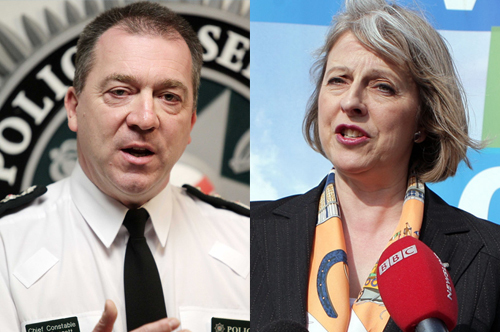 Under the current proposals the NCA would be answerable to Home Secretary Theresa May. In April 2010 policing and justice powers were devolved to Stormont, giving the newly established Department of Justice responsibility for criminal law, policing, prosecution, public order, courts, prisons and probation. However some policing and justice powers remain in control of Westminster. These include Royal Prerogative of Mercies (RPMs) in paramilitary cases, drug classification, Serious Organised Crime Agency (SOCA), parades, security of explosives, accommodation of prisoners in separated conditions, extradition, military justice, immigration and national security (including intelligence services). The nationalist parties’ decision to block the legislative consent means that the new NCA agency will only have limited powers to operate in Northern Ireland on reserved matters, such as national security, immigration and border control. Justice Minister David Ford described nationalist parties’ decision to block the legislation as a “mistake”. “There is a real danger if it does not go ahead there will be very significant costs to the police both in terms of time and finances and that we will have an inferior response to the serious organised crime that we face," he said. Legislation formalising the NCA is due to pass through the House of Commons on Thursday. The Detail understands Theresa May will make an announcement within the next 48 hours on how NCA will be allowed to operate in Northern Ireland in the absence of Stormont agreeing to grant legislative consent. Stormont sources have confirmed that ongoing talks between the Department of Justice and Sinn Fein and the SDLP have so far failed to find agreement on the issue. In the absense of nationalists agreeing to a legislative consent motion, it is understood the Home Secretary will have to alter arrangements on how the NCA will be allowed to operate in Northern Ireland. While senior police have supported calls for the NCA to be allowed to operate in Northern Ireland they have also called for the PSNI to have overall control and direction for any officers operating here. Speaking at the launch of the Policing Board’s annual report into human rights in January, PSNI Assistant Chief Constable George Hamilton said: “There is no doubt that the expertise of the NCA is necessary to keep people safe. “But operational control must fall to the Chief Constable. NCA’s operation in Northern Ireland must fit with the existing accountability structures of the Policing Board and the Ombudsman so that we can continue to maintain and build public confidence in policing. “We cherish the accountability mechanisms that have been built up for policing over the last decade. Earlier this month Chief Constable Matt Baggott spoke publicly during a meeting of the Policing Board about the ongoing political logjam relating to the NCA. “Operationally I do believe the NCA should work here only alongside us, to meet transparency of intelligence, operations and investigations. “If that was done with us, then I would be in control of the operations and as such vicarious and liable, and as such accountable to the Policing Board, and they are quite complex legal issues to be worked through,” he said. “I am confident that public safety does need to have the abilities and powers of the NCA, but yet I am also confident that something can be reached that probably suits all the concerns around accountability and answerability. When contacted by The Detail a Home Office spokesman refused to say exactly when Theresa May will reveal her plans to allow the NCA to operate with full powers in Northern Ireland in the absence of legislative consent from Stormont. However informed sources last night predicted that the statement’s announcement was “imminent”. The Home Office spokesman said: "We are disappointed by the Northern Ireland Executive’s decision not to give legislative consent for the new National Crime Agency.